If you’re headed to St. Paul, MN this fall and would like to explore Pickerel Lake, then check out the recently-opened Paddle Share Station. Located in Lilydale Regional Park, this new location offers single-person and tandem kayak rentals, as well as adaptive kayaking gear. 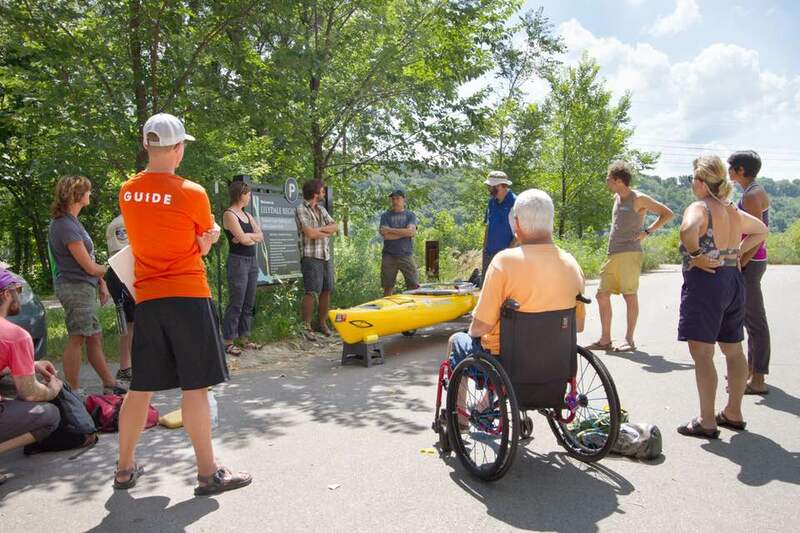 The adaptive equipment, which was provided by Creating Ability, includes a boat chariot (to launch the kayak), and a kayak with an adaptive seat, paddle and outriggers. It’s easy to reserve a kayak too — just go to www.paddleshare.org, choose your location and add the equipment to your shopping cart. After your order is processed you will be given a code to unlock a Paddle Share locker that contains the equipment. Kayaks can be rented for up to 1.5 hours, and must be returned to the same Paddle Share location. Rental rates are $20 for a single-person kayak, and $35 for a tandem kayak. There is no extra charge for the adaptive equipment. Kayaks are available on an abbreviated schedule this year (see below) due to unseasonable rains, but look for a more robust schedule next year. For more information, visit www.paddleshare.org.